After a busy evening showing property, I got a late start on my first for today, watching the 4th of nine movies nominated for Best Picture. Since Nebraska was again unavailable, I moved on to American Hustle. After a quick dinner, I brewed a pot of tea, getting to sample one of my new teas from Teavana. The Blueberry Bliss was delicious to sip on while watching this film. American Hustle stars Christian Bale, Bradley Cooper, Amy Adams, Jeremy Renner and Jennifer Lawrence. It was directed by David O. Russell. This movie was nominated for 10 Academy Awards including Best Actor for Christian Bale, Best Actress for Amy Adams, Best Supporting Actor, Bradley Cooper, Best Supporting Actress, Jennifer Lawrence, Best Director for David O. Russell, and Best Picture. It did not win an Oscar in any category, however this movie was nominated for 96 awards by various organizations and institutes, and won 50 awards. 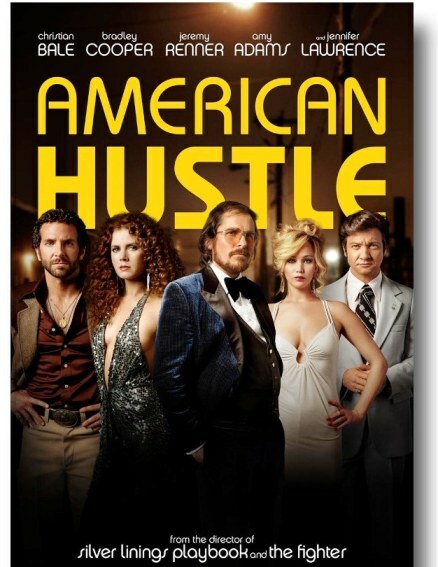 American Hustle is rated R and has a run time of 2 hours and 18 minutes. Most of the actors in the movie, called a comedy drama, are favorites of mine. So whatever the story was about, I was prepared to like it. Cradling my cup of hot tea, I was ready to be entertained. And entertained I was! From the opening scenes with Christian Bale’s character creating an elaborate comb over, to the closing scenes with Jennifer Lawrence’s portrayal of sassy Rosalyn, I watched with a smile on my face. This wasn’t a slap-your-sides-funny type of movie. It was a cleverly humorous film with nuggets of truth tucked among the one liners. Irving Rosenfeld, played by Bale, and Sydney Prosser, played by Adams, are con artist partners who are also romantically involved. Caught in a sting operation, they are promised they will be released without jail time if they will assist the Feds with four additional arrests. The Fed team is led by ambitious and unpredictable Richard DiMaso, played by Cooper, whose main desire in life is to make a name for himself. He goes after the mayor of Camden, NJ, Carmine Polito, played by Renner, who wants to revitalize gambling in Atlantic City but has struggled to raise money for his project. The cast is completed by Jennifer Lawrence, who plays Irving’s zany wife, Rosalyn. The story twists and turns around a ploy to catch Mayor Polito taking bribe money to help his city, and becomes a much bigger operation than anyone imagined. Amid the conning and the striving and the humor is a memorable story about what is real…in life, in relationships, and within ourselves. Each character is struggling to discover who they truly are and how to live, really live, as that person. Irving says, “We are all conning ourselves, one way or another. It’s how we survive.” Learning to move beyond survival and into life is at the heart of this film. American Hustle claims, at the beginning of the movie, to be based on real events. I researched that claim to find that it is loosely based on the FBI ABSCAM operation of the late 1970’s and early 80’s. The characters are all portrayals of real people. I heartily enjoyed the performances of this amazing cast of actors and the freshness of the movie. I adore cleverness. American Hustle is certainly that and at the same time, it’s a candid look into the human desire to be seen and appreciated for who we are.